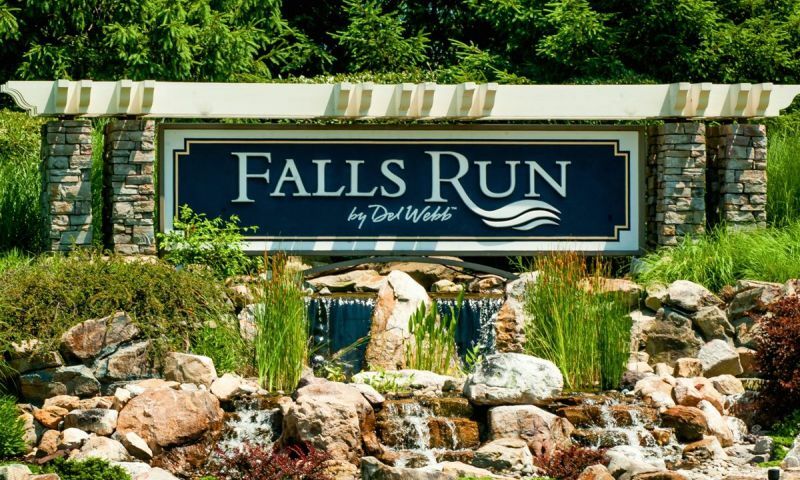 Falls Run by Del Webb is an active adult community located in Stafford County, about three miles from downtown Fredericksburg, Virginia. This gated community offers a complete adult country club atmosphere with first-class attributes and amenities. This 55+ community in Northern Virginia is comprised of resale detached and attached houses. Most properties at Falls Run in Fredericksburg are detached single-family homes. About one-third of all residences are attached villas. At the heart of Falls Run in Fredericksburg is the 16,000 square-foot clubhouse. The fireside library/lounge is the perfect space to relax over a favorite book. Additionally, there are a variety of activity rooms. These include billiards, meeting, and game rooms. A large ballroom is home to many organized events and social functions. The clubhouse also includes a fitness center and indoor pool that Falls Run residents can utilize to stay fit and healthy. Lighted tennis facilities and bocce ball courts provide opportunities for outdoor fun and friendly competition. There is also a large outdoor swimming pool with lots of space for socializing at Falls Run. Del Webb started construction of Falls Run in Fredericksburg in 2002. It took three years to complete all 781 homes. There are 582 single-family homes and 199 attached villas in this gated community. The single-family homes range in sizes from approximately 1,200 to 2,000 square feet, while the villas were designed to offer between 1,100 and 1,500 square feet of living space. There are six single-family floor plans and three villa floor plans in Falls Run. All single-family homes have two bedrooms, two baths, and two-car garages. Some houses have an extra den or a third bedroom. The Falls Run villas have one bedroom plus den, or two bedrooms plus den. The villas also include two baths and attached one-car garages. All homes in this 55 and over community offer optional basements. Residences in Falls Run at Fredericksburg are available on a resale basis. The association dues are reasonable, with the single-family homeowners paying a slightly lower amount than villa owners. The dues include use of all amenities at the recreation center, trash pickup, basic cable TV, snow plowing of community streets in the winter time, and year-round exterior and interior maintenance of all recreational facilities and common areas. Surrounded by easily accessible golf courses, Falls Run residents enjoy an active adult country club lifestyle in a great historic location of the United States. The on-site amenities are high-class, and a full-time activities director maintains an impressive schedule with an average of four planned events per month, regardless of the time of year. Residents at Falls Run in Fredericksburg also can participate in over 50 different clubs. Falls Run is an age-restricted community in Stafford County, Virginia that offers great dining, shopping, and culture. Old Town Fredericksburg has boutiques, antique shops, art galleries and studios and more. There are also plenty of museums and historical attractions all throughout the area. A one-hour drive can take residents to either Richmond or Washington D.C., depending on the direction. Richmond offers much for the history enthusiasts. It is home to the famous Monument Avenue Historic District and the Fan Area, which contains some of the oldest homes in the country. Metropolitan Washington D.C. s national monuments are truly spectacular and definitely worth a visit. Falls Run is a great 55+ community that offers low-maintenance homes and a vibrant lifestyle. Clubhouse - 16,000 Sq. Ft. There are plenty of activities available in Falls Run. Here is a sample of some of the clubs, activities and classes offered here. There are 199 attached villas within Falls Run. These low-maintenance resale homes have one to three bedrooms, two or three bathrooms, and a one-car garage. Some homes were built with basements, giving more space for storage. Please Note: Square footage is approximate. There are 582 single-family homes within Falls Run. Most homes have two to three bedrooms, two or three bathrooms, and an attached two-car garage. Available on a resale only basis, some homes were built with basements. Please Note: Square footage is approximate. I really like it here. I downsized from a 3,800 sq ft single family home coming from another state to a 1,200 sq ft single family home when I moved to Falls Run, but the fact that every home here has a two-car garage gave me much storage space (I had no garage in my prior home; just many bedrooms and recreational rooms). There was a lot of work involved, as I did the move myself, but it was worth it, as nothing was lost or damaged in the process. The residents are incredibly friendly here, and, on my daily walks within the large community, I stop and chat with all whom I meet.. It is bright, safe, clean, and peaceful in my home and community. While the area traffic is brutal (DC is the second worse in the nation after LA), one times one's travel to never be out on the road during rush hour. I hike and kayak in the area, so it is an excellent location for those activities. It is overall a good place to live. We purchased a resale home here a couple years ago. It was move-in ready so we just did a little painting and wallpaper then changed out some of the fixtures. The neighborhood is very nice and has a lot of pretty landscaping. The clubhouse has everything we wanted and we use it almost every day. Fredericksburg is a great town with lots of cute shops and restaurants. We really enjoy living here. We are very pleased with our new home in Falls Run. The house has a lovely view of woods and a layout that is very comfortable (3 bedrooms, 3 baths, large family room and walk out basement). And almost everyone here says hello and has welcomed us in. We get a bit of noise from I95 at certain times of the day but otherwise, it's all very appealing. 55places.com is not affiliated with the developer(s) or homeowners association of Falls Run. The information you submit is distributed to a 55places.com Partner Agent, who is a licensed real estate agent. The information regarding Falls Run has not been verified or approved by the developer or homeowners association. Please verify all information prior to purchasing. 55places.com is not responsible for any errors regarding the information displayed on this website.